PORTLAND --The San Antonio Spurs remained the hottest team in the NBA by beating the Portland Trail Blazers, 108-103, at the AT&T Center on Saturday night. Once in danger of missing a playoffs spot, the Spurs now improved their record to a comfortable 41-29, sixth place in the talent-heavy Western Conference. 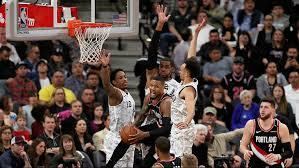 DeMar DeRozan was the main cog for the Spurs with 21 points and eight rebounds. Derrick White and Rudy Gay each had 13 points while LaMarcus Aldridge tallied 12 markers and eight boards. Patty Mills chipped in 12 and Marco Belinelli scored 11 for San Antonio, which hit a high 37 of 79 field goals, including 8-of-17 from 3-land. Despite shooting only 41.6 percent from the field, the Blazers took a 76-72 lead entering the fourth quarter. But the Spurs rallied and finished the last 12 minutes on a 36-27 run. Damian Lillard accounted for 34 points, six rebounds and five assists for Portland while teammate Jusuf Norkic had 24 and 16 boards. Rodney Hood contributed 13 for but Portland struggled from long distance, connecting a mere seven of 28 attempts. The Blazers were hampered by the loss of C.J. McCollum, who left the contest at the 7:03 mark of the third quarter with a left leg injury. "He's so big for our team. That's a big blow. He's a guy that plays a huge role for us and is a big part of our team," Lillard told The Associated Press. Despite the loss, however, Portland remained in fourth place in the Western Conference standings with a 42-27 slate. Click here to view a list of other articles written by Ryan Gallardo.